Expertly designed for ease of use and portability, the Scott & Lawson Hanging Washbag is the ideal solution to to all your travel needs. A stylish and practical gift for use at home and abroad, the portable washbag contains three separate pockets plus a flat zipped section, ensuring everything you need can be neatly stored and economically packed away. When unfolded, the travel bag reveals different sections for all your travel necessities. The washbag also features a convenient hanging loop at the top. The Scott & Lawson Hanging Washbag contains a zip section with mesh panel, three handy pockets with elasticated tops, and a zipped pouch with an impressive 2 litre capacity. The pouch is easy to wipe clean, and the whole thing folds in on itself for easy storage and maximum portability. The main part of the washbag is 100% cotton, with a 100% polyester trim and lining. Scott & Lawson is a brand range from Paladone. Inspired by the Edwardian department store, it aims to create high quality, durable products in an age of adventure, discovery and invention. Everything today’s explorers may need to aid and amuse them on their travels.Expertly designed for ease of use and portability, the Scott & Lawson Hanging Washbag is the ideal solution to to all your travel needs. 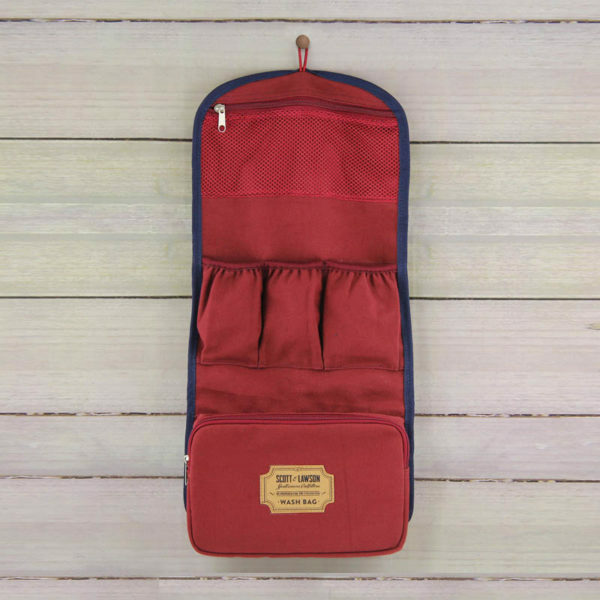 A stylish and practical gift for use at home and abroad, the portable washbag contains three separate pockets plus a flat zipped section, ensuring everything you need can be neatly stored and economically packed away.